The New York Times ran an article in its Magazine section discussing the creation of Hiroshi Tanaka, a Japanese inventor. It's a machine that uses electricity to "age" wine the equivalent of years of cellaring in only a few seconds. His invention uses electricity to break up the water molecules in the wine, allowing them to bond more completely with the other molecules...the ones that make wine different from water. In theory, at least, that's also what aging can take 10 to 20 years to accomplish. Tasters say that the machine can make a noticeable difference on a young, tannic wine in need of mellowing. In Japan, they've come up with a new way to celebrate the release of the Beaujolais Nouveau...bathe in it. A hot spring spa near Mount Fuji has decided to mark the arrival of the wine (which has become a popular fad in Japan) by pouring 12 bottles a day into one of its open-air pools. Bathers enjoy trying to catch the wine as it's being poured in for a quick slurp. 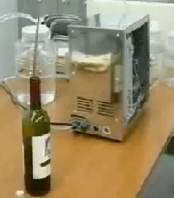 Researchers in Japan have developed a robot wine sommelier. This nifty gadget can "taste" a wine, identify it by brand and type, and suggest a good cheese or hors d'oevre to accompany it. The robot, a prototype, would currently cost as much as a car and can only be programmed to identify a few dozen wines, but that's still more than many humans can manage. It can be personalized to suit an owner's taste in wines, and can also perform other useful analysis, like determining the relative sweetness of a piece of fruit. 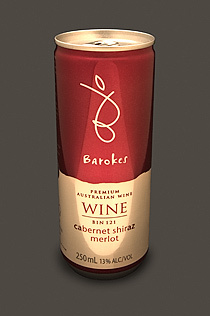 In 2002, Barokes Australia patented its design for wine in a can--the only patented canned wine in existence. And in a recent taste test, the Japanese gave it high marks. This patented wine-in-a-can promises a shelf life of up to five years, so it's ready for cellaring. In the taste test among 3000 Japanese, only 5% said that they found it odd to drink wine from a can. No one complained about the quality, but a few did say it would take getting used to.